I have made many items that I have given away either as gifts or to charity shops. This is an archive of all the items I crocheted before starting the Diploma that I still have in my house. Aran jumper, brown, now used for decorating. Aran jumper, natural wool. Very heavy. May unravel and reuse wool. Green striped DK wool. Great success! Cheap, quick, easy. May do again. I got some wonderful nettle yarn from yarnyarn, who sell really exciting yarns that are ethically and environmentally produced, something I want to focus on a lot more. I wanted to make something that showed the lovely texture of the yarn so decided on this chain necklace. I made a very long chain on a generous-sized hook and folded it over to give 8 strands to the necklace. Then I bound black yarn around the chain at intervals to add some interest, and a chunky clasp that can be worn either decoratively at the front, or hidden away behind the neck. I am very pleased with the result. A statement necklace that has already drawn compliments. I sent off the final requirements for Part 1 of the International Diploma in Crochet last week. This included my report, my written exam, which I am not going to add a link to and my record of work. I also included a bibliography of the books I have referred to while doing the course. My report on crochet held in local museums was a little disappointing as I drew a blank when it came to gaining access to the collection not on display due, I suppose, to cuts. However, I wrote it all up and am hoping all is well. Doing the Diploma has been brilliant for me. It has given me direction, given me validation, as someone objective has told me my work is good and provided really useful feedback; and taught me new skills so I am now (a bit) more patient and definitely more conscientious about putting right mistakes. I tend to give myself self-imposed deadlines, which can cause a bit of stress so I am going to try and avoid that in future when it is not necessary. Diploma – when (not if) to start Part 2. I’m going to be working all summer and am looking forward to having a break to work on my own projects before that so it’s tempting to wait until September. However, one of the great things about the Diploma is that there is no time limit. This means that I could get all the material now and mull it over while I’m doing other things and get down to earnest on it in the autumn. I suspect this is what I’ll do, and, despite trying to not give myself deadlines I’m already thinking of trying to complete it within 2 years i.e. September 2021. I’ll know whether this is realistic when I look at the material. Experiments – I have some new and unusual yarn that I want to try out, and ideas for necklaces and other jewellery. Skills – I am quietly working away at improving my jewellery-making skills through books and workshops at Raphael Crafts. I am having a go at spinning and designing a shawl for Pearl’s birthday. Show – I am going to Wonderwool Wales in a few weeks and really looking forward to that as it will be my first yarn show. I’ve booked onto two workshops: beading and spinning; and I’m hoping to say hello to Pauline Turner there. 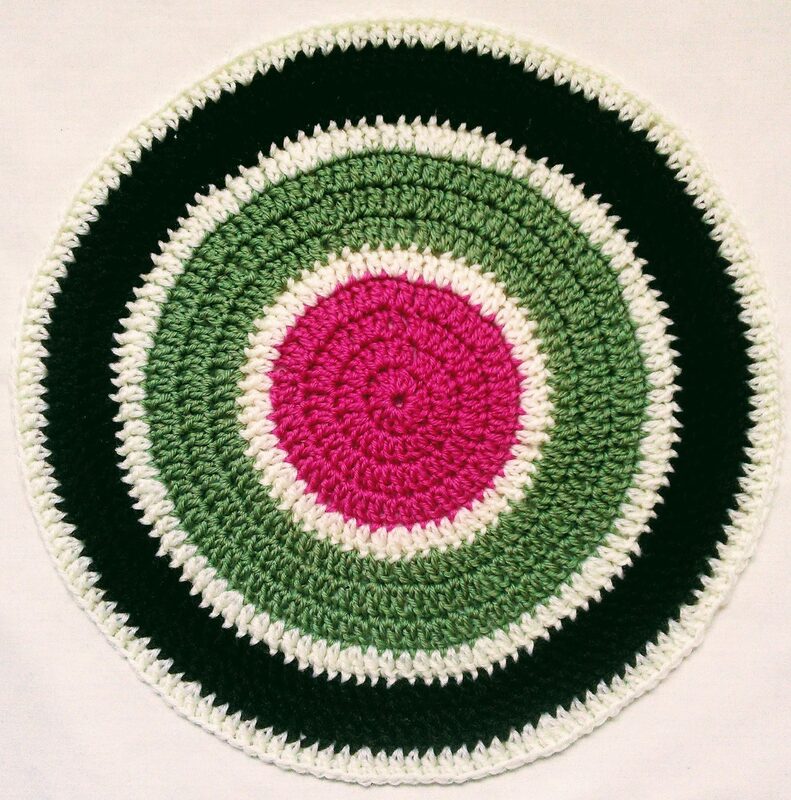 Blog – I’ve decided to take photos of all the crochet that I’ve made and still have in the house and add an archive of work completed before I started this blog. I’m also going to try and improve my photographic skills and may look at changing the appearance of the blog. We’ll see! My bag was judged to be very good and I got some very useful feedback, which I have now acted upon. The original handles were a bit flimsy and it was suggested that I put in extra rows of dc above and below the handle to strengthen it. I decided to return to the yarn used for the Tunisian and to do a couple of rows of Tunisian as this fabric was much stiffer and stronger. Dc rows were added as well. The result, above, is more functional and, I think, more attractive. I finally got an Excellent for my filet. So pleased! And my shaped piece got a Very Good. This was because the corners were rounded as I’d only put 2 dc in each one. I should have put in 3. I had been a little unsure about this and had gone for consistency, so it’s good to know. I’m so pleased. I made this . . . This was my final project that had to include Tunisian and broomstick crochet so I designed this myself. The yarn from Wool and the Gang was great and I think it’s somewhat sustainable. I’ll be looking at it again and I’ve got more ideas for using the raffia and the broomstick. I found the Tunisian hard work, especially with a 4mm hook but am quite taken with the Broomstick. The raffia holds its shape so you can take all the loops off together, instead of trying to prise them off in groups, which can be a pain. All the details are here.